If you’ve seen “Soul of a Nation: Art in the Age of Black Power 1963-1983,” the electrifying show at the Broad museum, you may sense a vibrant, relevant thread reaching toward Gavlak gallery, where the sculptures of Vanessa German in her first L.A. show are holding forth with commanding presence. German was raised in L.A. and now lives in Pittsburgh, where her commitment to resilience and renewal manifests in her practice not only as a visual artist but also a poet, performer and community activist. At Gavlak, the radiant stars of the show are five figures that stand a bit smaller than human height but which possess outsize energy, thanks to their declarative stance and the materials of their composition. Their bodies and features are baroque accretions of the everyday and the emblematic: shells, bottles, keys, stuffed fabric pouches, string, beads, rhinestones. As in the Central African tradition of nkisi, these are power figures composed of empowered objects and intended to heal, protect and ward off evil. They stand on platforms made of skateboards and concrete blocks, as if specially designed to combat the particular perils of contemporary urban life. 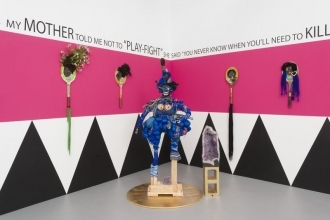 “A Physical History of Grace” descends directly from Betye Saar’s armed and able Mammy figures. Pouches of stuffed ticking encircling her neck allude to domestic labor; the white baby doll cradled beneath one conical clay breast suggests another way that she serves with her body. But like Saar, German bestows this character with dynamic self-possession. A “No Admittance” sign hangs on her back; a reflective red light dangles between her legs. She stands as an icon of reclaimed control over her person, her fate. “Been here the whole time,” begins a text painted across two walls. “I wasn’t waiting for you to ___ me before I could ___ myself. I have been here the whole time.” Beneath this all-caps, fill-in-the-blanks mantra of self-sufficiency hang more than a dozen tennis rackets painted with black women’s faces and embellished with ornate braids and jewels. One wears gem-encrusted brass knuckles as a crown. Others have hair spiked with feathers and rusty nails. Though less formidable than the free-standing pieces, these too render the assemblage tradition itself something to pick up, turn over and use as needed. German's work brings to mind not only Saar but also Joyce Scott and Shinique Smith. Strength — physical and spiritual — exudes from her work as if audibly, a proud shout.